SpartanNash was formed when Spartan Stores, based in Grand Rapids, Mich., merged with the Nash Finch Company based in Minneapolis, Minn. in November of 2013. Both companies have long and rich histories of serving their communities. 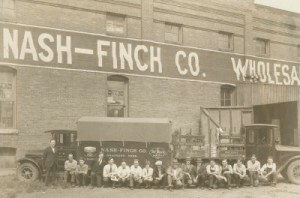 Nash Finch started as a family-owned business back in 1885 when brothers Fred, Edgar and Willis Nash opened a small candy and tobacco store in Devils Lake, North Dakota. The first non-family employee, Harry B. Finch, joined the Nash Brothers as a 14-year old stock boy in 1889 and worked his way up in the organization. In subsequent years the company became known as the Nash Finch Company with Harry as the company president. Spartan Stores began in 1917 when 100 independent retailers banded together to purchase in bulk and pass the savings along to their customers. 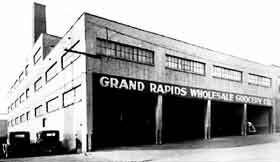 In 1918, 43 of the original retailers signed the Articles of Incorporation for the Grand Rapids Wholesale Grocery Company; their first purchase was a boxcar of sugar. Both companies have grown throughout the years, expanding retail and wholesale operations. In 1995, Nash Finch acquired Military Distributors of Virginia (MDV), and our commitment to serving our military heroes whether at home or abroad began. In 2017, SpartanNash acquired Caito Foods — which specializes in fresh produce distribution and fresh food processing — and BRT, its managed freight and logistics solutions company. The partnership enables SpartanNash to bring high-quality produce and fresh protein-based meals and snacks to our store guests and independent customers.